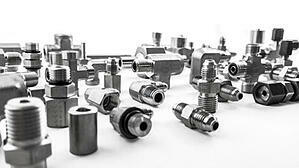 SSP manufactures a broad line of stainless steel pipe fittings for instrumentation and industrial applications. In addition to NPT fittings, SSP offers BSPT fittings, and SAE and BSPP straight threaded fittings from 1/16 up to 2 in. SSP offers two lines of instrumentation grade stainless steel pipe fittings: TruFit® and TruFit 10K® pipe fittings. TruFit10K pipe fittings are designed so that all 10K fittings are rated to 10,000 psig. All TruFit and TruFit10K fittings are manufactured to restricted thread tolerances to provide extended thread engagement for a tighter seal. TruFit10K pipe fittings are available only in 316 stainless steel. TruFit fittings are available in 316 SS, Alloy 400, Alloy C-276 and brass. NPT fittings are cleaned and individually bagged and capped to prevent contamination and damage prior to installation. SSP manufacturing, assembly, and shipping processes maintain material traceability. Material certifications are available on request. Sizes from 1/16 to 2in. SSP offers three lines of line of industrial stainless steel pipe fittings: Threaded Pipe Fittings and Adapters, Pipe Swivel (NPSM) and Koncentric Pipe Unions. Alloy 400 and brass are also available for many configurations. SSP industrial pipe fittings are found in hydraulic systems, chemical plants, and all sorts of industrial and military equipment where leak-tight performance is required. SSP produces all forgings in our in-house forging operation. This allows us to control the metalurgical properties and dimension of all pipe fitting elbows, tees, crosses. Rolled threads are used extensively, again for superior strength and holding capability. All pipe fittings are manufactured to comply with the design criteria of Society of Automotive Engineers Standard J514, and ASME 31.3 and 31.1 and other industry standards. Sizes from 1/8 – 2 in.